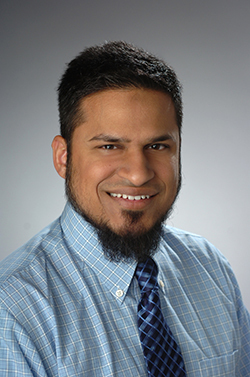 Assistant Professor Ian D. Hosein in the College of Engineering and Computer Science has been awarded a Doctoral New Investigator (DNI) Grant from the American Chemical Society Petroleum Research Fund. The DNI grant program promotes the careers of young faculty by supporting research of high scientific caliber and enhances the career opportunities of their undergraduate and graduate students through research experience. It is awarded to just 75 assistant professors across the United States each year. Hosein’s research explores novel ways to harness light to make materials used in solar energy and heat conversion, electrochemical energy storage, chemical separation and smart coatings. His research group’s work spans the spectrum from fundamental formation mechanisms in matter, to materials fabrication to application-driven research and development. The DNI grant will support Hosein’s research to control the synthesis of multicomponent polymeric materials using white light for two years. The work will explore processing conditions that produce novel composite structures and advanced material properties critical for use in lithium-ion batteries, thermoelectrics and oil-water separation. Hosein is an assistant professor in the Department of Biomedical and Chemical Engineering. He completed his graduate studies at Cornell University in the Department of Materials Science and Engineering. He was awarded a Natural Sciences and Engineering Research Council (NSERC) of Canada fellowship in support of his graduate studies. After his doctoral work, Hosein completed post-doctoral positions at the University of Waterloo and McMaster University. His research aims to provide materials-based solutions that address critical challenges in clean energy production and storage, environmental remediation and clean up, and sustainability. The present focus is on creating new materials from both organic and inorganic systems, with an emphasis on directed self-organization, bio-inspired structures and enhancing material properties. Hosein is also editor-in-chief for the journal Canadian Chemical Transactions and an editor for the open-access journal Scientific Reports.